Do you want to know the best clear lens computer glasses for this year 2018? Are you curious if it can help in blocking the harmful blue light from entering your eyes? Well, I suggest that you give time and read this article to learn more about them. Computer glasses is an effective solution to prevent the harmful blue light and radiation from entering our eyes. But then, most computer glasses have strong tint on the lenses. This results to some concerns such as some color distortion. On the other hand, clear tinted lenses are already available. Basically, they have transparent tint that enables same protection that strong tinted lenses give. Some of the people that can benefit from these eyewear are graphic designers, architects, and those people that needs the true color on their digital screens. So I decided to make a list of the best clear tinted computer glasses that you can use. This list is based on the effectiveness, quality, affordability and style of the glasses. The frames are translucent with streaks or layers between the upper and lower half of the rim. The lenses of these Kirka glasses are capable of providing “superior or premium blue light blocking” property. The glasses come with a soft cleaning cloth and a hard case. An advantage of using acetate over plastic is the vibrancy of colors and intricacy of design that the manufacturer can make. This product can be worn especially in front of radiation-emitting devices such as laptops, desktops, tablets, cellular phones, television screens, and even fluorescent lights. The lenses of this MIDI glasses follow the shape and size of the frame. All the lenses are rectangular. MIDI glasses are anti-radiation glasses. The lenses block 43% of blue light and 99% of ultraviolet (UV) rays at 400 nm wavelength. The slight magnification on the lenses relieves the eye muscle from too much stress preventing the eyes to twitch. All glasses are shipped with soft portable pouch. The pouch helps to prevent foreign agents like moisture, oil, grease, dust, and dirt from staining the glasses surface. The frame is colored black. Having a neutral and universal color, these glasses may be paired with any outfit for different occasions. With Cyxus, color distortion would not be a problem. Nonetheless, its performance is comparable to those with noticeable yellow color. The lenses are made up of polycarbonate. It is a kind of polymer commonly used for optical devices because of its clarity and resistance to impact. The glasses come with a highly attractive and stylish frame structure. These black-brown full-rimmed frames fit almost all head sizes. The lenses are made from a high-end plastic material that is quite flexible and strong. These transparent lenses deflect almost all the high energy radiations and protect the eyes from getting damaged due to this radiation. What I like the most about these glasses is the accessories included on the package. Unlike any other computer glasses, this eyewear includes a hard case, soft pouch and also cleaning cloth. This particular model of EyeYee employs thin rounded or rectangular frame. Basically, 97% of blue light is blocked without the lenses having a stark yellow tint. A bonus feature of the lenses is its anti-glare (AR) property. One thing that I like about EyeYee is its variety. There are many designs, shapes, and colors for the frames. The lenses follow the shape and size dictated by the frame. The outermost layer is the scratch-resistant layer followed by the anti-glare (AR) layer. The next layer offers 100% ultraviolet (UV) protection. The glasses include a microfiber pouch which act as a cleaning cloth and a ready-to-go container. The light weight of the frame brings comfortability to the user. Since acetate is the material of the frame, complex design and vibrant colors are also made possible. What I like the most about this eyewear is that the frames are very light. There are also adjustable pads on the nose support bridge that helps in adjusting the nose grip tightness and obtaining an excellent grip for all the nose sizes as well. 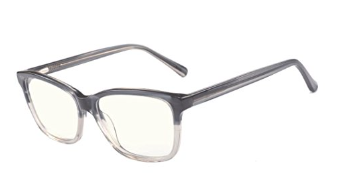 Unlike other common computer glasses, the lens of this eyewear is crystal clear. The tint is transparent which makes it really easy to adjust to and work with. This tinting is responsible for reducing the eye stress. This pair of glasses offer a classical-designed frame. The style is usually used by beginners in order to give ample time to assess which style fits them. A unique feature of these glasses is that they are bendable. Screws secure the joints with appropriate tension for easy folding. The folded glasses save space and are handy. The material is also flexible so it is less prone to mechanical breakage. The material is also light with a weight of 1.6 ounces. Aside from blue light and anti-UV layer, the lenses have seven more layers. The surface is protected with anti-scratch layer which prevents the lenses from mechanical abrasions. The frame is long-lasting. Breakage can be prevented because shock can be absorbed by the material. Lastly, the frame is made to be very lightweight and comfortable to use. It weighs at a whopping 1.9 ounces. The lenses also greatly reduce glare emanating from cellular devices making these gadgets more bearable to look at. Hence, there would be longer duration of using cellular devices while maintaining the eyes protected. A bonus would be the scratch-resistant property of the lenses. This makes the eyewear really suited as an active wear and prolongs its durability. The lenses have a slight magnification that makes reading easier. This magnification helps in forming a clearer and more popped up text images on the screen that helps in reducing the eye strain. The lenses also prevent dry currents from reaching the eyes. These are just some of the best clear lens computer glasses that you can take advantage. 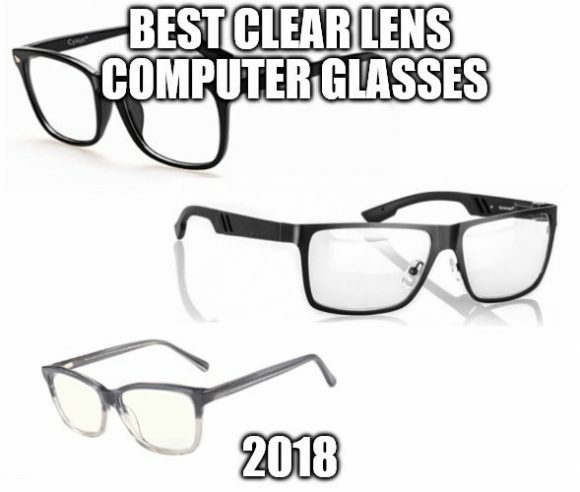 Personally, I prefer the Spektrum premium and Cyxus computer glasses. They have simple design and the price is reasonable. Nevertheless, all of these glasses have proven their worth as a protective eyewear. So it is just a matter of preference and it depends on your needs. Thanks for this site. I own a pair of clear blue blocking glasses called blue shield. They block blue light from 400 to 460nm. Alot of these glasses don’t clearly show you how much blue light they block. Just wondering if you know if any of these block higher then 460nm? Glasses sellers drive me crazy because their idea of bad blue light is from 420 to 455nm so then they will say blocks all of it. I’m under the impression it needs to at least block up to 470. Even BenQ monitors blue light mode only blocks to 455nm. Any help would be greatly appreciated. Actually, all of these computer glasses block the blue light. So you don’t need to worry about the range of blue light blocked. 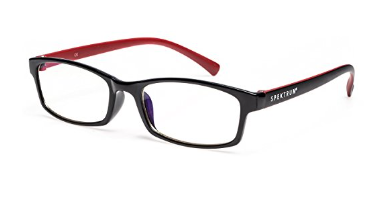 I’ve been looking for new gaming glasses a little while, and these should help me a ton. You sold me on the MIDI Colors Blue Light Blocking Computer Glasses. It is amazing how the government doesn’t regulate blue light. I’m so glad that I finally found a super affordable option too. I am glad that I have helped you. Please let me know if you need more help. Hey John. May have to bookmark this article and grab myself a pair of these. I suffer migraines on occasion due to eye strain, particularly after sitting in front of a computer for long periods of time. I wasn’t aware that glasses like these existed. Is there a pair that you’d recommend amongst those you’ve listed here that are best for anti-glare? That’s what gives me the most trouble I sometimes find myself squinting because of the glare that omits from my computer screen. I personally prefer the MIDI glasses and Pixel glasses. Aside from its anti glare properties, you can choose variety of style and color. Hi John, I had no idea that computer glasses were available. I have been online for 21 years, not only at home but also in my work. I have been told many times by my optometrist that my daily usage of computer time was ruining my eyesight. Are these recommended or endorsed by optometrists? If your eye issues is not yet major then you can certainly use computer glasses to prevent further damages. But if you already feel something really bad in your eyes, I suggest that you ask first your doctor just to be sure. Thanks for this article John. I did not know of the existence of these specialist glasses before. I am naturally short sighted and age has added long-sightedness to the equation. This means normally I do not use glasses because nothing gives me that focal range of the monitor. I like the idea of a gentle magnification like in the Midi glasses. I find reading a lot easier if there is a slight magnification. In fact now I am spoilt for choice. I will have to follow the links through again and have a good study of the different styles. No need to worry. I suggest that you look into your options so you can find the best one that suits your needs.